This great new shield promoting the recent XBOX 360 game Halo 3. The symbol has been painted in metallic silver paint and looks fantastic when the light hits it. Stainless steel studs line the border and the shield itself is made of 0.5 inch thick smooth composite wood, which is considerably stronger than plywood. Dual leather straps are used to secure the arm along the back one going over the forearm and one intended to be gripped or held. The Wooden Halo 3 Shield has also been applied with several coats of varnish to further protect and preserve it from wear. 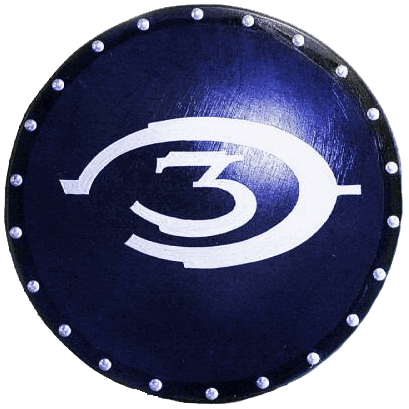 The Wooden Halo 3 Shield measures about 25 inches in diameter. Proudly display this item next to your TV or game console and do not miss your chance to own this unique, custom-made item! This Wooden Halo 3 Shield would be perfect for that upcoming cosplay convention in your area, theatrical productions, or maybe some backyard brawling between friends. This wooden shield would also make a great gift for fans of the Halo 3 game.